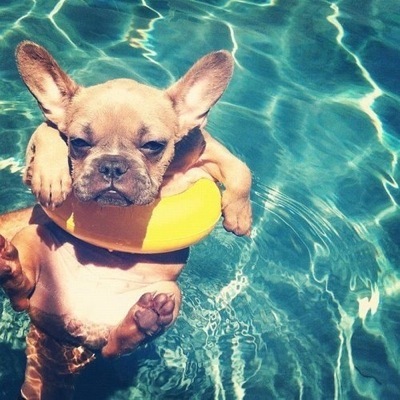 The Dog Days Of Summer are here! We all know what that brings, humid weather, high temperatures and smog advisories. During these hot summer days dogs have a higher possibility to be exposed to heat strokes. In this blog, we will teach what a heat stroke is, how you can prevent it and how you can treat it if it happens to your pet. Dogs and cats are very different that us. Their bodies respond to things very differently than ours does. To the point, they thermoregulate differently that we do. Thermoregulation is how one regulates body temperature. Unlike us, a dog’s thermoregulation system is better for preserving energy, rather than releasing it. This is why dogs are capable of heating up faster than humans. Hyperthermia is term used for increased body temperature above the normal threshold. We are familiar with two types of hyperthermia: a non-fever and fever hyperthermia. The hyperthermia that is followed with fever indicates to some kind of inflammation, while the non-fever one most commonly indicates to heat stroke. How to prevent a heat stroke? There is a list of things that we need to be aware of so we can prevent a heat stroke. We should always take care for the freshness of the dogs’ drinking water. Provide shaded areas if the dog spends time outside. If your dog has health issues, like respiratory problems, heart disease, or it is elderly dog, you should schedule the physical activities for cooler days. Also you should keep it in the shade and have limited exposure to the sun. These precautions also refer to obese dogs. You should NEVER, under any circumstances leave your dog in the car! – This is one of the most common reason for heat strokes and heat related deaths of pets. You should skip the idea for accompanied jogging with your dog on a hot summer day. On a hot summer day you should also avoid using muzzle on your dog. The muzzle prevents proper ventilating, which leads to obstructed thermoregulation. You should also consider avoiding the places with hot concrete, asphalt or send. If you are on the beach, let the dog in the water to cool down. After the swim provide shaded area for your pet. 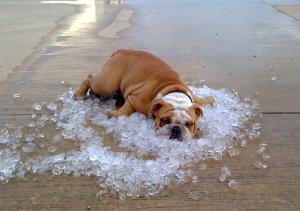 If your dog is home during the hottest days, even if you are not in the house, always keep the air conditioning on. First step is to relocate your dog from the heat! It is advised to be in moved to an area with lower temperature and air conditioning. It is helpful to pour fresh water, with room temperature, on your dog. Freezing water is not an option. Try offering your dog fresh drinking water, but if it isn’t capable of drinking on its own, don’t force it. Again offering your dog freezing water is not an option. Avoid using vet towels to cover your dog, this will lead to trapping the heat. Instead, you can place wet towels under your dog, this will help to cool it down. It is necessary to take your dog to the vet. Supposedly you’re not a professional, your dog should be examined by certified veterinarian and if there are indications for dehydration it should be treated with some IV fluids. We hope you gained useful information from this article. Keep your pets safe!